This summer in the Grand-Massif ski domain, there is a huge ongoing investment in a development project to considerably expand the ski area and transform links. 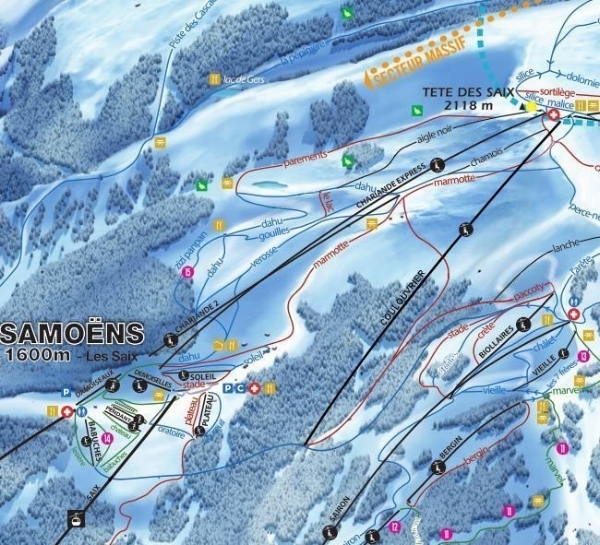 The development of the Coulouvrier bowl between Morillon and Samoëns includes the creation of 4 new ski runs (2 blue runs followed by 2 red runs for the 2018/2019 winter season), an addition of 42 hectares of pistes to the ski area. There will be a new 6-seater, detachable Coulouvrier chairlift, departing from 1200m and arriving at 2120m. With a record length of 2850m, this will be the longest lift of its kind in Europe, making the way in 9 min, with a theoretical throughput of 3000 people per hour. There is also the development of the snow-making network with the siting of 70 snow cannons to cover this zone. The key intersection at Tête de Saix summit is currently being extensively landscaped, this will hugely alleviate, what has been a busy bottleneck, as several ski-lifts share the piste off the summit crossing over between the resorts of Flaine, Les Carroz, Morillon and Samoëns. It will also optimise improve safety for skiers and this transformation will afford a 360º view of the whole of the surrounding panorama. Creation of a 110,000 M3 reservoir in the Veret sector. This will integrate into the natural environment and providing the resort with a tenfold increase in its snow-making capacity. This resource will be of particular use for enhancing the natural snow coverage on the pistes leading back to the resort.